The Potato of Bologna is a potato variety grown in the Bolognese territory, particularly in the reclaimed lands of the Idice plain, whose local capital is Budrio. The “Primura” potato variety, which was selected in the Netherlands, started to be grown in the Bolognese territory between 1960s and 1970s: owing to its organoleptic characteristics and adaptability to all culinary uses, the Primura potato has obtained the PDO (Protected designation of origin) status. 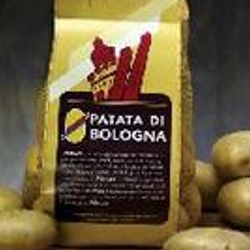 The "Consorzio Patata di Bologna DOP" is responsible for promotion and protection of the PDO Potato of Bologna. The Consortium is composed of two associations of potato producers, cooperatives and potato private dealers. Botanist Giacinto Ambrosiani of the University of Bologna discovered the curative properties of the potato plant in 1657, while Pietro Maria Bignami, agronomist and landowner, promoted potato cultivation in the second half of the 18th century. Even though it was considered as the “fruit of the devil” because it grew underground, it fed European troops as they passed through the Bolognese territory and so it defended farmers' houses against the raids of the troops. The intervention of Cardinal Opizzoni was crucial for promoting as well as spreading potato cultivation in the whole Bolognese territory, but it took two centuries to make it a practice among the Bolognese and Italian people as well. Land under potato crop was about 4,900 hectares after the World War I and the best parcels of goods were exported to Germany, Switzerland and France. Agricultural mechanization led to an increase in the potato production during the 1950s, considered as the golden years for sugar beet, maize and wheat. The Potato Museum in Budrio has housed a collection of agricultural machinery and tools since 2008. There is also a Documentation centre for potatoes that controls and spreads information about potato production on a local, national and european scale thanks to the National observatory. The “Borsa Patate” has been existing since the mid-1970s as a unique place where potato producers, dealers, and cooperatives fix the reference price of potatoes. Every summer in Sant'Agata Bolognese there is a festival dedicated to the potato: the "Sagra della patata".